The latest London site to receive a Grade II listing isn’t an architectural marvel beloved of Prince Charles, but instead a humble zebra crossing. Joining the Tower of London and other famous structures such as Buckingham Palace on the list is the pedestrian crossing near the Abbey Road studios The Beatles made so iconic. 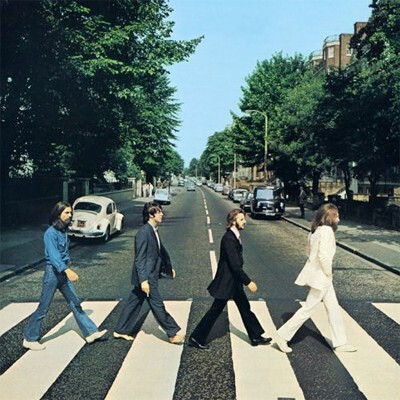 The crossing, which appears on the Fab Four's 1969 album Abbey Road, has become one of the capital's biggest attractions as tourists renting London holiday homes venture there to mimic the image of Paul McCartney, John Lennon, George Harrison and Ringo Starr crossing the road. The black and white crossing, which is thought to have moved slightly from its original position, has now been given official recognition by heritage minister John Penrose. The nearby studios were listed in February. Audio from Special Ops Media, New York and is used with their permission with our sincere thanks. Paul McCartney's digitally re-mastered 1973 epic album "Band on the Run". Our review includes a photograph of the mixing board that was used to record the album. NEW YORK - Thirty years after his untimely death, gunned down in the street outside his New York apartment, John Lennon remains a legend whose music and drive for world peace has inspired generations of artists. Related Links: Magazine publishes Lennon's last print interview; Fans gather in Liverpool for Lennon death anniversary; Lennon left a lasting impression; Yoko Ono celebrates life of Lennon on his 30th anniversary; Dr. Stephan Lynn, the doctor who tried to save John Lennon remembers the icon's dying day. Paul McCartney was the special guest at the White House last night at a reception by President Barack Obama and his wife, Michelle ahead of the Kennedy Center honours. McCartney - and other guests including Oprah Winfrey - were in Washington to receive the presitigious awards recognising lifetimes of work in music, theatre and television. During the glittering reception President Obama made fun of McCartney, saying he had become "something of a regular here in the White House". The Beatles have sold more than two million songs during their first week on iTunes, it emerged yesterday. All 13 of their albums became available through the online store last week following decades of legal rows over distribution rights. More than 450,000 albums were sold between November 16 and 22 - with Abbey Road the most popular. Here Comes The Sun was the best-selling song and 11 albums by Sir Paul McCartney and the rest of the Fab Four were in the top 25. The releases came three years after the Beatles' management firm, Apple, and record label EMI settled their dispute. On the very first day of its digital sales, renowned music group the Beatles dominated Apple’s online music store iTunes. Fans of Beatles have waited for years to get the voice of their star singers on the world’s largest online music retailer as the music band kept a long-standing hold-out. But, Apple confirmed that Apple joined the long-awaited digital revolution. Earlier on Monday, Apple posted a notice on the home page of its iTunes Store stating that the company would make an exciting announcement on Tuesday morning. The agreement was hit following a series of discussion between Apple and the representatives of the Beatles and their record label EMI. Last year, Beatles sold 3.3 million copies of music albums, grabbing third position in the list of highest number of music album sales in the US. A total of 54 Beatles’ songs grabbed positions in the list of iTunes top 200, in just first 24 hours of the availability. Hey Jude was the most downloaded tune. It peaked at number 28. Twist & Shout, Here Comes the Sun, and Let it Be were also among the top 50. Apple Inc. says Beatles fans will finally be able to buy the Fab Four's songs and albums on iTunes, ending one of the most glaring gaps in the catalogue of the world's most popular digital music sales platform. After a decade-long holdout, Beatles label EMI and Apple Corps Ltd., which manages the affairs of the legendary group, announced the change Tuesday in a joint news release with Apple Inc.
George Harrison's legendary solo album All Things Must Pass, one of Rolling Stone's 500 Greatest Albums of All Time, will be remastered and reissued as a limited edition three-LP vinyl collection on November 26th. (That's one day before All Things Must Pass Has its 40 anniversary.) The individually numbered reissue, which was remastered at Abbey Road Studios using the original analog master tapes, will be released exclusively to stores that participate in Record Store Day. 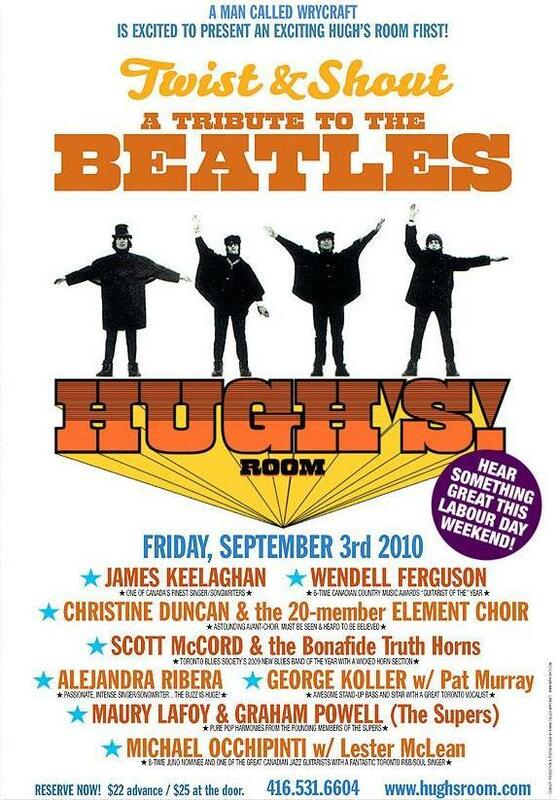 The disc will also be available for download that day on George Harrison's official site. Related links: George Harrison's 'All Things Must Pass' Remastered and Restored for Limited Edition, Numbered 3 LP Vinyl Collection Commemorating Album's 40th Anniversary - from PR Newswire; George Harrison's "All Things Must Pass" returns to vinyl in November reissue - by Steve Marinucci of the Examiner.com. The Beatles singer, assassinated in 1980, now joins William Shakespeare, Sir Winston Churchill, Charles Darwin and Florence Nightingale in the series. Britain's Royal Mint has issued a commemorative coin with the face of John Lennon, the former Beatle who was killed 30 years ago. 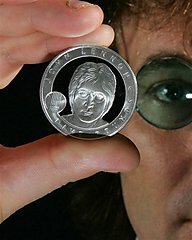 Lennon, shown with sideburns and his trademark round glasses, adorns the face of a new £5 ($8 Cdn) coin issued Friday. Ringo Starr's former home boarded up to stop Beatles fanatics stealing bricks (from the Daily Mail with photos); Imagining a Young John Lennon (from the Ottawa Citizen). There's nothing like kissing and making up in the Rock and Roll world, but it seems the two surviving Beatles may be taking it a bit literally. Paul McCartney and Ringo Starr were reunited once more by McCartney's daughter Mary, who was launching her new photograph book From Where I Stand. The mini reunion comes days after McCartney, 68, discussed the rift that tore the Beatles apart in the press. He said: "Personally it was a nightmare. It was really difficult, because I knew I didn’t hate them, but I knew we had to save The Beatles, and I was the only one who was going to do it - because the three of them were just sending it down the chute." All is clearly forgiven now though, as the two looked closer than ever at the book launch, which was also attended by a pregnant Stella McCartney, Starr's wife Barbara Bach and his daughter Lee Starkey. Remastered Red and Blue albums are out today! We are very pleased to announce that The Beatles’ original 1973 compilations, 1962-1966 “Red”, and 1967-1970 “Blue”, have been digitally remastered for worldwide CD release and are available in stores globally from today. Both 2CD packages include expanded booklets with original liner notes, newly written essays by Bill Flanagan, and rare photos. 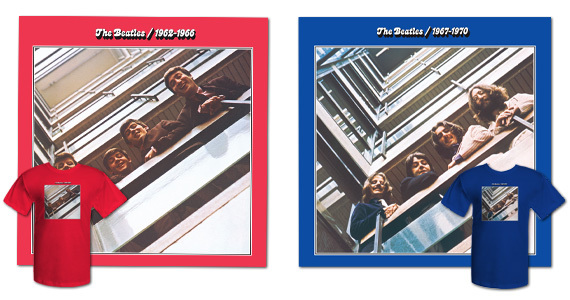 The first Beatles compilations to be released after the band’s 1970 disbandment, the popular “Red” and “Blue” collections each feature a selection of singles and album tracks written by the band’s members. “Red” and “Blue” have been remastered by the same dedicated team of engineers at EMI Music’s Abbey Road Studios responsible for remastering The Beatles’ original UK studio albums, carefully maintaining the authenticity and integrity of the original analogue recordings. The result is the highest fidelity the catalogue has seen since its original release. 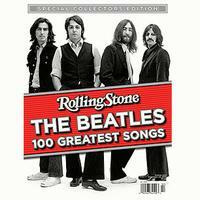 Don't hesitate to spend $12 on this entertaining and well presented selection (in the opinion of the editors of Rolling Stone) of the Beatles' most enduring songs - taken from their total output of 219 songs. Spiced with lots of pictures you may not have seen before, the book is a series of well-written vignettes from #1 to # 100. You'll also find other interesting statistics, such as how many of the top 100 were on each album, Paul's and John's favourite Beatles songs, and who actually wrote the top songs. What is #1? Go and get the book while it's still available! The Ottawa ByTowne Cinema presents the movie "Nowhere Boy" on October 29, 30, 31. Synopsis: NOWHERE BOY, the debut feature of Sam Taylor-Wood, tells the never seen before story of John Lennons childhood. Imagine John Lennons childhood: A spirited teenager, curious, sharp and funny, growing up in the shattered city of Liverpool. Two extraordinary sisters tussle for his love - Mimi, the formidable aunt who raised him from the age of 5 and Julia, the spirited mother who gave him up to Mimis care. Yearning for a normal family, John escapes into art and the new music flooding in from the US. His fledgling genius finds a kindred spirit in the young Paul McCartney. But just as Johns new life begins, the truth about his past leads to a tragedy he would never escape. Please consult the Ottawa ByTowne Cinema calendar for movie start times. Google embraced what would have been John Lennon's 70th birthday by creating a doodle similar in the style of the composers own artistic ability. The doodle was featured on their search engine. REYKJAVIK (Reuters) - Artist and musician Yoko Ono said on Friday she was still getting over the death of her husband John Lennon, who was gunned down in New York nearly 30 years ago. "Everybody loves you when you're six foot in the ground," John Lennon sang on Walls and Bridges, the 1974 album that Yoko Ono, in a new set of liner notes, now calls "one of the masterpieces of classic rock." Exclusive by David Edwards, Mirror U.K.
Yoko Ono wells up when she recalls the moment John Lennon's spirit returned to their home days after he was murdered in 1980. A sculpture has been unveiled to celebrate the life of John Lennon, on what would have been the music legend's 70th birthday. 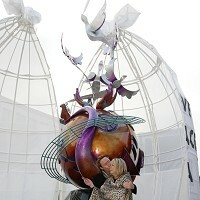 The monument designed to promote world peace was revealed at a ceremony in the late Beatle's home town of Liverpool by his first wife Cynthia and their son Julian. They thanked the hundreds of people who gathered in the city centre's Chavasse Park and told them to celebrate Lennon's life. 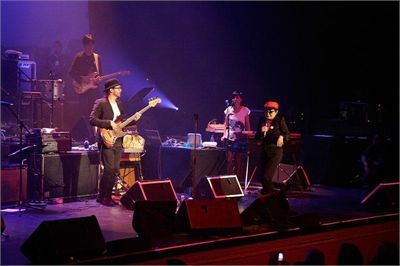 On Saturday night Yoko Ono and her son Sean Ono Lennon celebrated the 70th birthday of John Lennon and the 35th birthday of Sean by giving a concert with their revived Plastic Ono Band in Háskólabíó Reykjavík. A crowd of over 1,000 people watched the 77 year old artist run around the stage, singing in her very special way, songs that almost nobody in the crowd knew, mostly songs by Yoko Ono. On the screen Yoko showed bits of movies she has made, including Bottoms, a movie about people showing their behinds while talking and Fly, about a fly crowling over Yoko’s naked body. 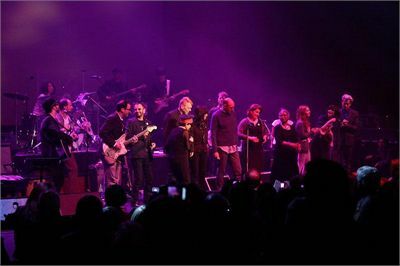 In the end the mother and son were joined by a number of guests, including Beatles’ drummer Ringo Starr and George Harrison’s widow Olivia and son Dhani Harrison all singing Give Peace a Chance.  Copyright © 2010 Icelenad Review on-line. All rights reserved. Dark Horse Records recently announced the October 19th release of a limited edition deluxe box set, entitled COLLABORATIONS. The release honors the sitar master’s 90th birthday. The DVD is a rare concert performance of Ravi Shankar’s Music Festival From India recorded at London’s Royal Albert Hall in 1974. The albums include the acclaimed Chants Of India (1997), The Ravi Shankar Music Festival From India (studio version 1976) and Shankar Family & Friends (1974). The 56-page book includes a foreword by Philip Glass, a history of George and Ravi “in their own words” and rare photographs from both family archives. Collaborations is available on Dark Horse Records. Special plaque for the 'fifth Beatle' Brian Epstein in Seven Dials by the British Broadcasting Corporation; Cilla Black honours 'fifth Beatle' by the Jewish Chronicle Online; Sir Paul McCartney in HP cloud digitise deal by Maggie Shiels of the BBC; Raga Reloaded - A rare documentary on sitar maestro Ravi Shankar by George Harrison, made in the ’70s, is ready for re-release as revealed in Indian Express.com; Yoko Ono Revisits John Lennon's Archives for "Truth" by Gary Graff, Rolling Stone/ABC Online interview; Beatles' fans begin to dismantle Ringo Starr's birthplace by Aaron Sharp, Click Liverpool; Quarrymen pay tribute to John Lennon by Gary Puleo of the Times Herald. A re-release of Paul McCartney and Wings' 1973 album Band on the Run is set for November 1, according to a September 16 announcement on McCartney's website. A deluxe edition package will include rare footage of Paul and Linda McCartney, a book of previously unpublished photographs, and a new interview with McCartney. Originally released in December 1973, Band on the Run topped charts in the UK, US, and Australia, won a Grammy Award, and has sold more than seven million copies. Recorded in Lagos, Nigeria, the album features Paul McCartney, Linda McCartney, and Denny Laine, and includes the hits "Band on the Run" and "Jet." The reissue will be available in a standard edition as well as two additional formats: a special edition with nine bonus audio tracks, rare footage of the McCartneys in Lagos, promotional video clips , and the television special One Hand Clapping; and a deluxe edition that adds a 120-page hardbound book with previously unpublished photos by Linda McCartney and Clive Arrowsmith, plus album and single artwork, a history of the album, an audio documentary, and a new interview with Paul McCartney. Band on the Run will be the first release from the Paul McCartney Archive Collection, a reissue program that will ultimately encompass 40 years of McCartney's music. It will be out on November 1 in the UK and November 2 in the US. The standard and deluxe versions will also be available digitally worldwide. An English Heritage blue plaque to John Lennon is to be unveiled in London by Yoko Ono Oct. 23 at 34 Montagu Square, a former home of John Lennon and Yoko Ono. John Lennon and Yoko Ono moved in the address in July, 1968, when the Beatles were recording "The Beatles" White Album. They shot the famous ”Two Virgins” album cover in the basement and were also arrested at the flat after a police drug raid. To read Steve Marinucci's full report from the examiner.com, click here. On September 11th and 12th, I attended the Montreal Tattoo Convention which was held at the Gare Windsor. 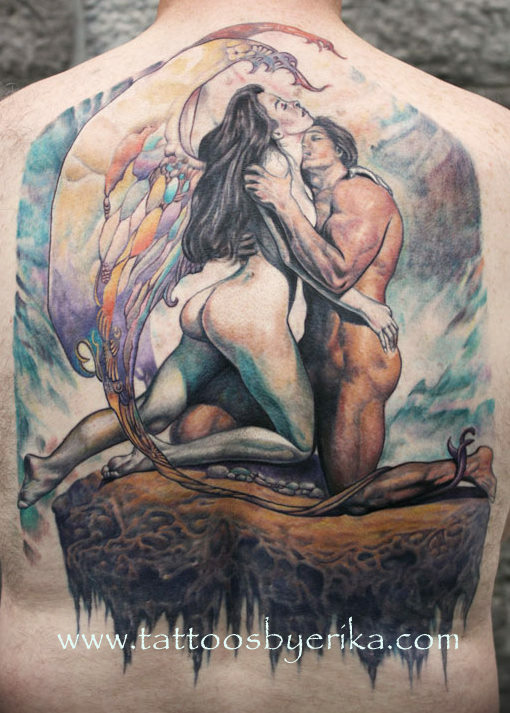 I was at the convention to have my tattoo completed (see below) and then submitted the piece into a competition in two categories: "Realist black or color" and "Back black or color". 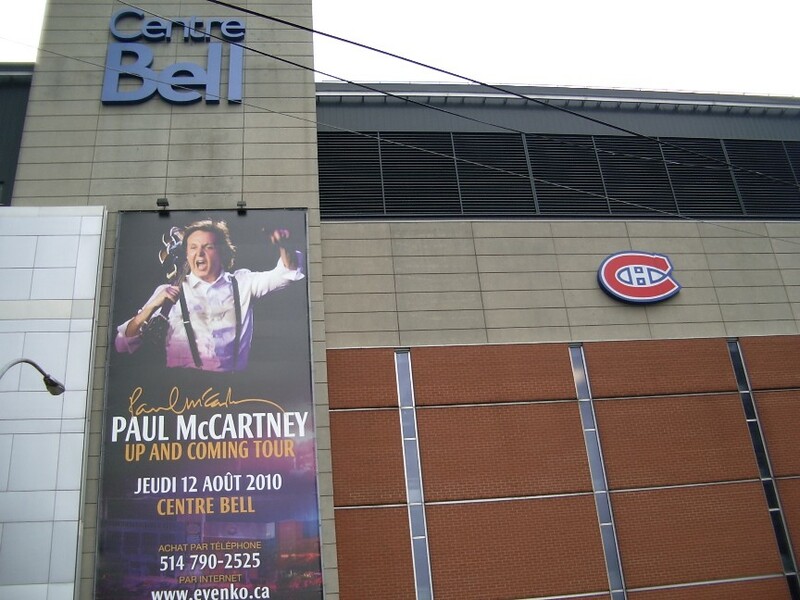 The contest for these two categories was held on Sunday and it was on this day that I spotted the large Paul McCartney promotional banner at the Bell Centre which is right beside the Gare Windsor on 1160 de La Gauchetière. I was a bit surprised that it was still up there 4 weeks later! Anyway, I couldn't resist taking this picture where he rocked at the Bell Centre — Paul, truly one of the most gifted musical composers of our times! The highly talented tattoo artist Erika Doyon proudly smiles beside John Whelan with her finished portraiture of "Forever Moments" which was created originally by fantasy artist Boris Vallejo. In case you are wondering, the tattoo took 35 hours to complete that involved 12 tattoo sessions. Erika works at Living Colour Tattoo Studio in Ottawa one week of each month. She also has her own personal studio in Montreal where she resides. The Beatles were always into art. I wonder what John Lennon and Stu Sutcliffe would have said about this piece if they were alive today? I think they would be pleased. Why even Paul and Ringo might like this!